This image illustrates the global regions Australian military personnel have been supporting the United Nations. The medals are not in a order of precedence and an illustration only. FOR AUSTRALIA THE VIET NAM WAR WAS TO BE A POINT OF NO RETURN IN RELATION TO FOREIGN AND MILITARY POLICY. THE VIET NAM WAR 1962 -1973 WAS THE FIRST TIME, EXCEPT FOR KOREA THAT AUSTRALIA WAS NOT IN DIRECT SUPPORT TO A COMMONWEALTH NATION. THIS WAR HAD BEEN WON IN 1973 BY THE FREE WORLD FORCES, A PEACE ACCORD WAS SIGNED IN PARIS DURING THAT YEAR BY NORTH VIETNAM. FOREIGN OPERATIONAL TROOPS WENT HOME AFTER THE SIGNING AND THE NORTH VIETNAMESE WITHDREW, NOT TO NORTH VIETNAM AS AGREED TO BUT TO CAMBODIA AND LAOS. EARLY IN 1975 THE NORTH VIETNAMESE INVADED SOUTH VIETNAM AGAIN. THIS TIME DEFEATING THE REPUBLIC OF VIET NAM. AUSTRALIA'S MILITARY GLOBAL INVOLVEMENT HAS BEEN CONTINUOUS SINCE THE KOREAN WAR. THE DEFENCE FORCE HAS BEEN INVOLVED IN THE UNITED NATIONS OPERATIONS IN AFRICA, THE MIDDLE EAST, ASIA AND THE SOUTHWEST PACIFIC. THESE COMMITMENTS CONTINUE TODAY AND AUSTRALIA'S MEN AND WOMAN ARE ALWAYS THERE TO ANSWER THE CALL. In 1947, our first group of military observers - probably the first United Nations peacekeepers anywhere in the world - numbered just four.
" from the Australian War Memorial web site"
AS WITH SIMILAR SINGLE MEDALS LIKE THE UNITED NATION'S MEDAL, VARIOUS RIBBONS ARE USED TO DISTINGUISH THE REGION OR LOCATION OF THE OPERATIONS. 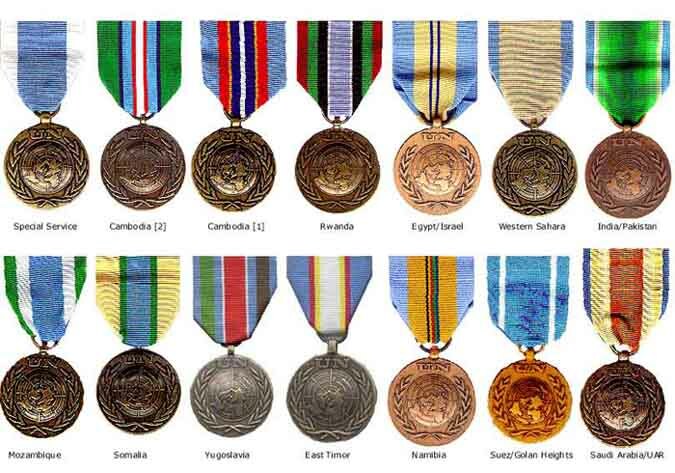 WHEN AUSTRALIANS ARE INVOLVED IN A SPECIFIC REGION THAT IS PART OF NATIONAL POLICY AND NOT INVOLVING THE UNITED NATIONS A SPECIFIC MEDAL IS STRUCK, FOR EXAMPLE EAST TIMOR, 1999. This medal is awarded to those Australians, very few, who were members of the Commonwealth Monitoring Force from 1 December 1979 to 20 March 1980.